Operator and outfitter of offshore facilities must be able to rely on men and machines. Far from the coast, even small problems can have huge consequences. Moreover, the safety requirements in offshore applications, for instance on oil rigs, are stringent. Bosch Rexroth offers drive and control solutions for the industry that consistently withstand waves, wind and salt water. Our customers are supplied with individual components as well as systems tailored to their specific needs. We understand offshore facilities as individual projects that require extensive support. Bosch Rexroth therefore acts as partner to its customers - from planning to realization. We provide concept development, feasibility studies, production, installation and worldwide service all from one source. Drawing from our extensive application experience, we use simulation programs to analyze feasibility and safety. This allows us to identify and remedy any potential weaknesses already prior to actual production. 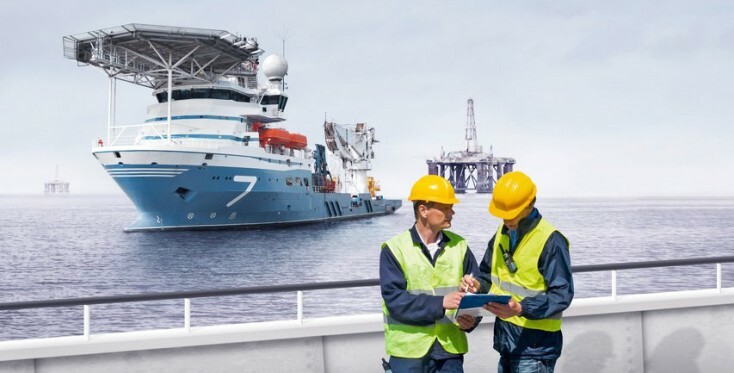 Skidding, jacking, heave compensation, deck-mating – Bosch Rexroth's offshore systems cover all areas of work on the high seas. For example, as engineering partner to the Allseas Group, Bosch Rexroth developed components for the drive and control solution for the world's largest lifting device for offshore installations. The special vessel can lift and transport topsides of offshore platforms weighing up to 48,000 tons in one piece. For comparison: The Eiffel tower barely weighs one fifth. On land, these gigantic structures can be disassembled at a much lower risk and cost than at sea.